• How long will my material last? • Will it look good on my project? • Can I combine different siding materials? 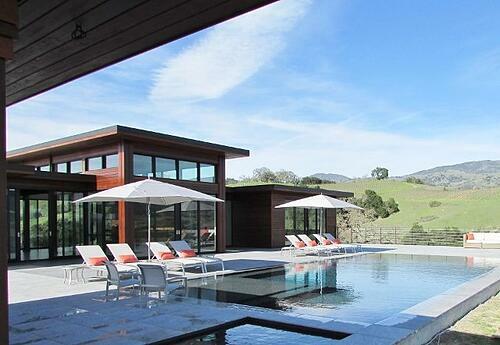 The cost of the siding material is certainly a key factor in your decision making process. 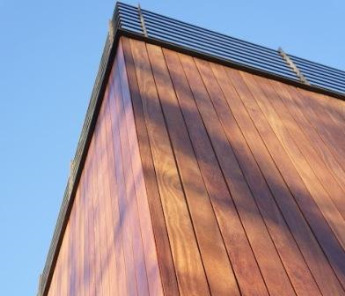 Choosing the right siding material for you is an important decision and includes many factors in addition to material prices and initial material costs. Selecting a siding material is one of those options that has an extremely wide range of pricing. There are literally tens of thousands of different siding material options to choose from. Siding materials vary in price from $6 - $7 per square foot to $100 per square foot and higher for the material costs alone. However, siding cost isn’t the only consideration to make. From an aesthetics and first impression standpoint, the siding material that you choose for your home, building or other structure is usually the first thing that a visitor or passerby will see. "Curb appeal" is based on the location, grounds and outside of your property. What does your siding material choice say about you and your property? Let us help making choosing siding stress free. Vinyl siding - is the most popular material for new siding and is priced from low to high, depending mostly on the thickness and quality of the vinyl. Available in many colors and textures. Higher priced vinyl siding has less tendency to crack and buckle. Fiber cement siding- is a low cost paint-able siding option. When installed properly, many mold issues are minimized. Cedar Shakes, shingles and clapboard- are a medium cost, natural softwood siding option. Appearance, durability and performance varies depending on the quality of the materials and installation. A rain screen type of installation will help minimize mold and some of the rot and decay issues. Softwoods are typically not as durable as hardwood siding options and should be re-finished as needed to maintain appearance. Synthetic Stone veneer- is a medium priced cladding option and is often used as an accent to other siding materials to improve curb appeal. 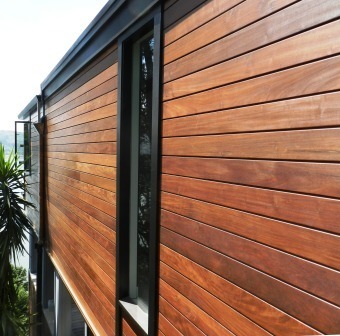 Hardwood Rain Screen Siding- is a rapidly growing, medium priced cladding option. 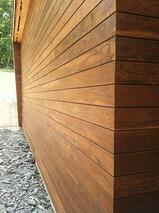 Hardwood siding has excellent durability, natural beauty and curb appeal. The rain screen installation helps extend the life cycle of the structure, and improves the overall health, efficiency and sustainability of the home or structure. Learn more about Rain Screen siding. 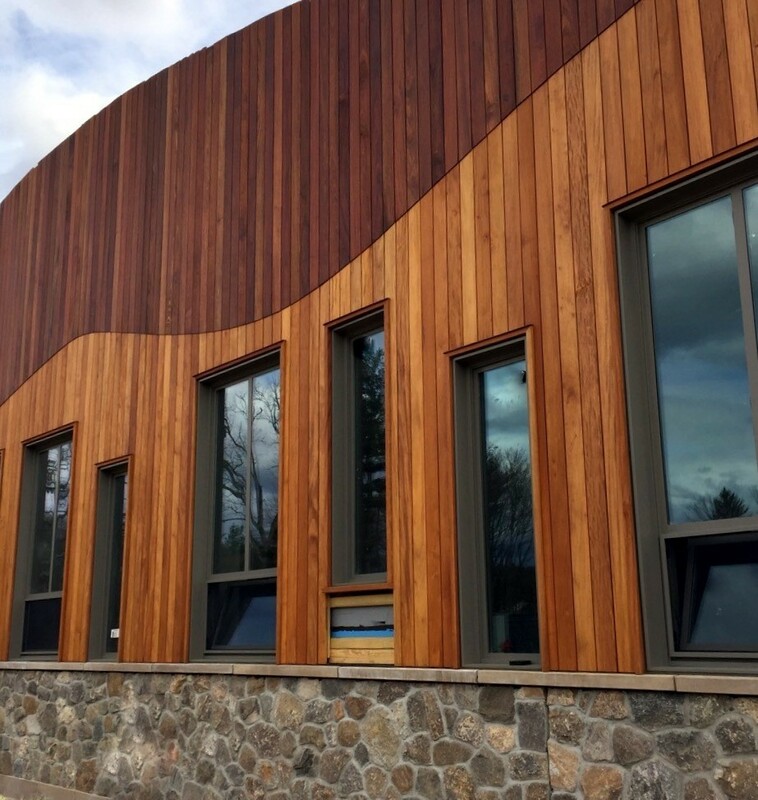 Trespa Pura NFC® Sidings - is a medium priced alternative to wood siding with the look of natural wood in a low maintenance cladding solution. Natural Stone and Brick- are the highest price cladding options and are typically used as an accent on one or more sides of the home or structure. This pricing comparison chart should help you establish some "ball park estimates" for siding materials to help you develop your building materials budget for your project.